Quick Overview: Aramid fiber packing braided from high quality Dupont aramid and kevlar fiber with PTFE impregnated and lubricant additive. It is wear resistant but may damage the shaft is not used properly. A minimum shaft hardness of 60HRC is therefore recommended. 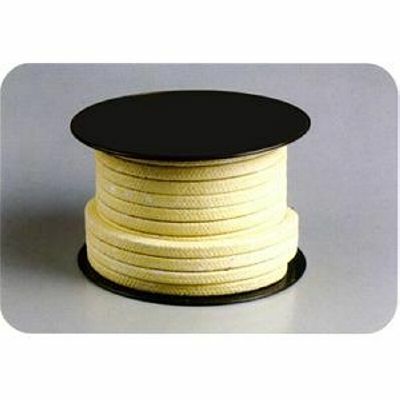 Aramid fiber packing is braided from high quality Dupont aramid fiber with PTFE impregnated and lubricant additive. It shows good chemical resistance, high elasticity and very low cold flow. It can resist severe media and higher pressure. The packing is lubricated with silicone based compound for quick and easy break-in. Without impregnation, an extremely durable, highly abrasive resistant packing. It is an idea for slurry service application. * It is wear resistant but may damage the shaft if not used properly. * A minimum shaft hardness of 60HRC is therefore recommended. * A durable packing able to withstand granular and abrasive applications.